Inspiration comes in many forms. 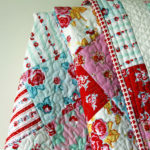 For me, as with many quilters, it is often the fabric that catapults me into a new design. Goodness only knows why we fall in love with certain fabrics and not others, but luckily for us, there is something for all tastes and styles. My latest love is Baby Jane from Moda. The colour is Happiness Grey. That is the most perfect name. It makes my very happy. Over the past week I have been playing around with a nine patch block my friend, Beverley had shown me. The grey, white and lemon just seemed to be a perfect fit. The same block is made in two colour-ways. The light/dark effect is what makes the pattern. I love that I can see circles happening, but they disappear when I look directly at the image. The finished size of the block is twelve inches. There are 25 block is total – thirteen block 1 and twelve block 2. 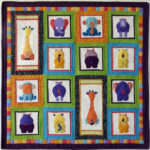 The addition of lots of borders makes a simple quilt more exciting. The final border is pieced. The finished size is 216cm x 216cm (85in x 85in). I know some quilters can be daunted by pieced borders, so I have given detailed step-by-step instructions. 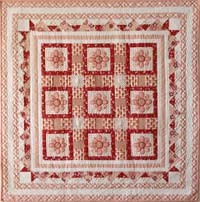 This quilt would be lovely in any colour range that makes you happy and is available as a Free Pattern for you to download now. I hope you enjoy making Mellow Yellow. Beautiful !! Love your grey/yellow 🙂 ! !